Have you ever been taxiing your machine to the end of the runway and gotten a little carried away with the speed. Putting your foot down at 35 mph is dangerous. 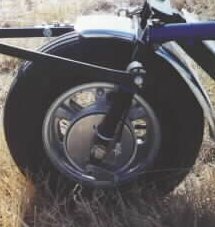 Fortunately, a simple nose wheel brake can be installed for about $60.00 with off the shelf parts, and a minimum of fabrication. I have only installed this brake on a Six Chuter SR7 and it works fine. David Bauchspies has adapted the same parts to work on a Buckeye (see below). It may or may not work on other units. Before you order the parts be sure to measure the distance between the front forks. You will need at least 5 3/4 inches to install the brake and still have the wheel centered. I won't go into too much detail here because most people who undertake a project like this have enough mechanical background to figure it out for themselves. Buckeye and Six Chuter use the Asuza 8" aluminum wheels, and Asuza makes brake parts for that type of wheel. The two main parts you will need are the brake shoe/back plate assembly, and the brake drum. The best price I found on these parts was at Wicks Aircraft Supply, 800-221-9425. Order an AZ-2530 BRAKE ASSEMBLY, $28.95, and a AZ-2542 BRAKE DRUM, $9.68. Total bill including shipping UPS ground was $44.26 (prices as of 5/98). In addition, you will need to pick up a few things from the local bike shop. You'll need a mountain bike brake lever assembly. The standard mountain bike handlebar diameter is 7/8" but Six Chuter uses a 1" stick, so get a lever that you can make fit the larger tube. Also pick up a mountain bike brake cable, 4' of cable housing, a cantilever brake cable terminal, and an adjustable ferrule. Total cost should be around $15.00 depending on how fancy you want your lever to be. You'll also need some nuts, bolts, etc., from the hardware store. 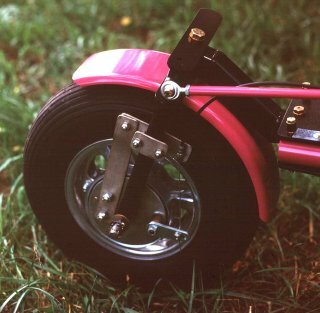 To keep the wheel centered in the forks, you'll need to cut a 3/8" piece from one of the front axle spacers. The 3/8" piece will go between the fork and the backing plate. The remaining part of the spacer will go between the backing plate and wheel bearing. You'll also need a 3/8" spacer for the backing plate mounting bolt. 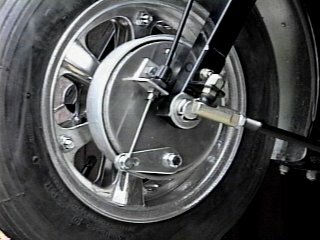 I am sending you a jpg showing how I used your ideas for a front brake and adapted it to my 582 DM. I made an arm and bracket sorta like the old Bendix bicycle brake, and clamped it on the fork so I would not have to drill any holes. Works great. I've installed nose wheel brakes on 3 buckeyes using your engineering. But instead of drilling a hole in the fork, or creating a clamp like David Bauchspies, I simply use a U-bolt to clamp the brake onto the fork. I find stainless steel U-bolts at the hardware store and cut the threads the right amount so they don't dig into the drum assembly. I use nylon threaded stainless steel nuts to hold it on. Works great! Remove the front axle bolt. The front wheel assembly comes right off, just prop up the PPC on a box. Place the drum over the wheel indents (they line right up to the wholes in the drum) and use the drum to keep the drill bit from walking off the spot you're drilling. 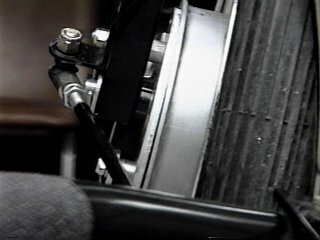 The hardware to hold the drum on the wheel consists of 3 bolts, and 3 nylon lock type nuts available at the local hardware store. On the buckeye you can use a 1 1/4 diamater u bolt through the holes in the assembly and simply bolt the assembly on to the fork. You'll need a cable mount. I made mine (and 2 others for friends) using 1" aluminum angle, also available at the local hardware store. Drill holes through the stock before you cut it. It's easier to drill into a long piece than a short one. Drill a hole into the brake assembly (make sure not to drill into the brake pad area, just below it is out of the way enough) and bolt the mount on. The cable, housing, clamp and tension thingy (see I'm not an engineer) was available at the local bike shop. Since the brake drum is about 1/4 inch thick, you need to cut down the wheel spacer by that amount with a hack saw. I put a socket (socket wrench type) inside the spacer far enough down from the kerf to keep the spacer round while it's in the vice while cutting. It's aluminum so it custs easily. Bolt the wheel back on and that part of the assembly is done. You're right that most bike brake handles are too small for the steering lever, but there's an easy answer to that. 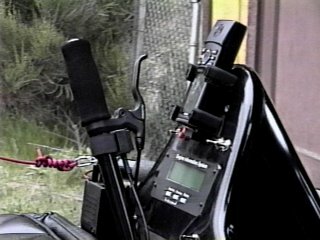 You simply use a pipe cutter (the type a handy man would use to cut copper tubing, you know, you clamp it down, twist around the pipe, twist the handle, twist around the pipe...) and lop off about 4 inches of the steering handle. Get yourself a smaller diameter (about 3/4" OD) tube and insert a couple of inches into the steering handle still on the PPC, and a few inches into the handle end. Leave a 1 inch gap, and you've got a 3/4 inch spot to clamp your brake handle on to. Pop rivet the handle back on, and you've got it. Oh yeah, you need to trim down the brake cable as it's too long out of the package, and wire tie the cable to the steering handle all the way down to the brake assembly. don't go that fast on landing for long. Or of course you can spend $240 for "the kit". See Also Marty Ignazito's brake kits.